Is it “can’t” or “won’t” when it comes to summarizing the reasons people fail to organize their stuff? And does it apply to you? “Won’t” is the lack of initiative or desire. The five main reasons fall into BOTH camps: Can’t AND Won’t. Mindy (fictitious name) tells me “I just don’t have the gene to organize.” Could it be genetics that stop Mindy from organizing her important household stuff? Could it be a neurological issue? Mindy is a very creative (right-brained) individual. For decades, Mindy has tried to read books in many failed attempts to follow guidance on organizing papers and assorted stuff. Does it sound familiar? She feels like a failure because she can’t maintain a system of organization. Plus, She rarely remembers where she puts her stuff. Yes, many disorganized people complain about their memory. While cognitive decline is a real thing, finding yourself overwhelmed can affect thinking, especially, in my experience, with creative people. Reader, you may be chuckling as you recognize the trait in yourself, but you know it’s not funny. It can be painful. People spend hours each year searching for important information that they put “in a good place.” They spend more money than necessary to replace items that were put away but can’t locate. Organizing overwhelms, and many smart people truly believe they’re hopeless. They develop bad habits, leaving things around their home and office because they think that the “stuff” will be visible to find at a later date. But nothing can be found when you need it. The lucky ones find help, or find a partner to assist, and to compliment this “missing gene.” Some, however, don’t let others in, and end up unhappy. Starting a new project can be daunting. Some people need to be in the right frame of mind to start a project, while others can “Just Do It.” If you are easily distracted, especially if the project is that dreaded ORGANIZING. Distraction can be a disorder and a house filled with stuff, with dozens of unfinished projects, may point in that direction. If you think you’re overwhelmed because of Attention Deficit Disorder, get an evaluation. The right treatment can make the job of organization a thousand times easier. 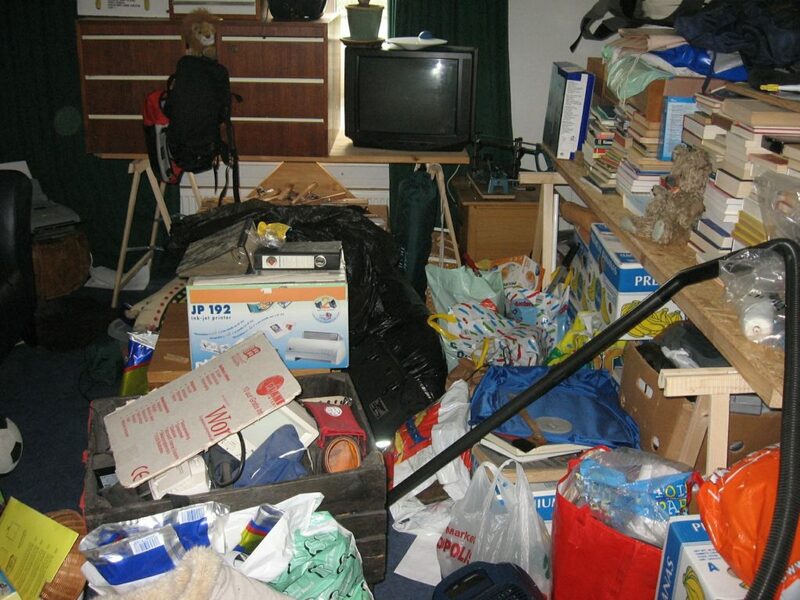 With or without ADD, many people don’t know how to begin to sort through all their stuff. When sorting through the past, the trips down memory lane can divert you off on tangents. It is a normal hazard when going through old things. It’s not hard to reminisce the day away. Robert (fictitious name) wanted to transition his business. He had an office filled with papers: client material, marketing material, and personal papers. He also had a habit of making multiple copies of each paper to be sure he always had a copy. This compensatory mechanism made his office look like a sea of random papers and files. The task of “organizing” the papers of the old business was impossible. He lacked the motivation to get started because he didn’t know how. And, so the business transition could not begin. The old business made Robert unhappier each day, and he was stuck. Each folder he touched stirred up old (good and bad) memories. He couldn’t get out of his own way to organize. Empowering himself to learn how to get started, and stay focused, helped change his life. Also, learning how to conquer his personal challenge of starting new things gave him a new confidence. Yes, our feelings get in the way – with relationships and our relationship to stuff. Rhonda (fictitious name) refused to keep a calendar/date book because she wanted her life to be flexible, be a butterfly, do as she pleased. Often, any plans made in advance were forgotten unless a good friend called her to remind her. Now, that’s a good friend, but then again, maybe that “friend” actually enabled her fairy tales. More often, her plans were cancelled at the last minute because something better to do came along. Bills went unpaid. Piles of mail, and assorted papers and household items, collected on tables, under tables, and inside cabinets. Rhonda did as she pleased, until her husband wanted to refinance the house. Their credit rating was so low because of so many unpaid or late paid bills, their refinancing was rejected. Rhonda only wanted to do things that were fun. She constantly compared her life to others’. She festered over the thought that someone else’s life could be better than hers. I could tell you how her life turned out, but this time, I’ll let you fantasize. We think too much. Some think they have to clear the decks before they can plan or organize. They have so much stuff in the way, they think they have to clear away the “stuff” before organizing. Angela (fictitious name) had boxes and files full of personal memories and professional accomplishments, all mixed together. She wanted to embark on a new job search, and needed to put together a resume. Angela wanted to use some examples of the materials located in these files as resume points. She was FROZEN. Angela felt that she had to go through EVERYTHING before she could even START organizing her resume. She needed guidance, and fortunately found that guidance so that she could begin her journey to find her dream job. Clearing and organizing go hand in hand. As you start to clear, you get a clearer idea of what is left to organize. Then, the organizing process will flow easier as you’re gradually familiar with your “stuff”. Every craftsman knows that “Good tools aren’t cheap; Cheap tools aren’t any good.” There are so many good organizing “tools” at varying price points. Have you been to The Container Store, Bed Bath and Beyond or Home Goods lately? You’ll find a dizzying array of organizing “tools” in those and other stores, as well as online sources. Those who can’t organize, because they need to find the “right” tools first, are land locked in their stuff. Others may purchase a wide variety of inappropriate tools, adding to the accumulation of clutter. Organizing is an ongoing activity. Oh, did you think that once you’re organized, you’re organized? The organizing process evolves just like we do. Our needs change, as do our systems. There’s never a right time to organize. We make the time. If you learn to organize each day, just a little, a great deal can happen. Start with your bed, and move on to your work or your house. Tackle a little at a time, and learn not to be afraid of clearing, organizing and discarding. Soon it will become natural. Finally, whether you CAN’T or WON’T organize your stuff, enlisting help will empower you to accomplish these and other Herculean tasks. Yet, once things begin to clear out, you’ll begin to feel freer, only to have the energy to do more. Organizational phobias do exist with multiple can’ts and won’ts. As with most phobias, the best way around them is through them.